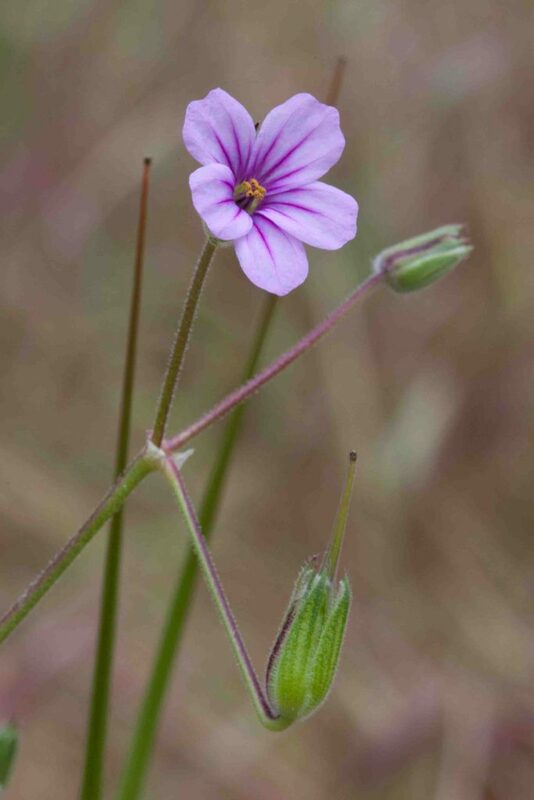 The various Erodium species are all pink flowered and have similar shaped fruits which give them one of their alternative common names of Crane’s Bill or Heron’s Bill. 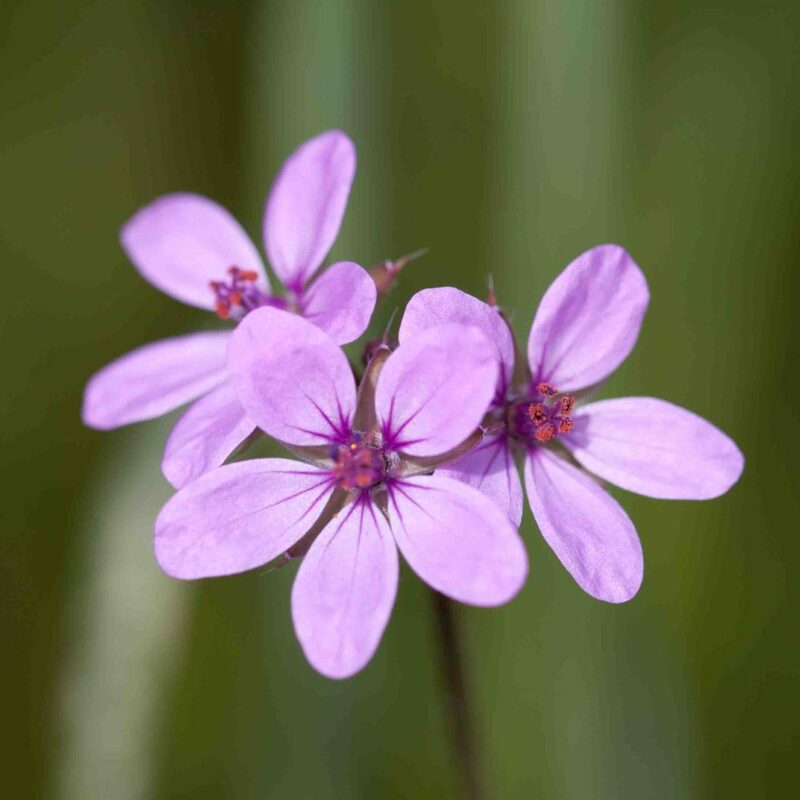 This species is deeper pink than the others and the flower is more cup shaped with broader petals with prominent darker pink striping. 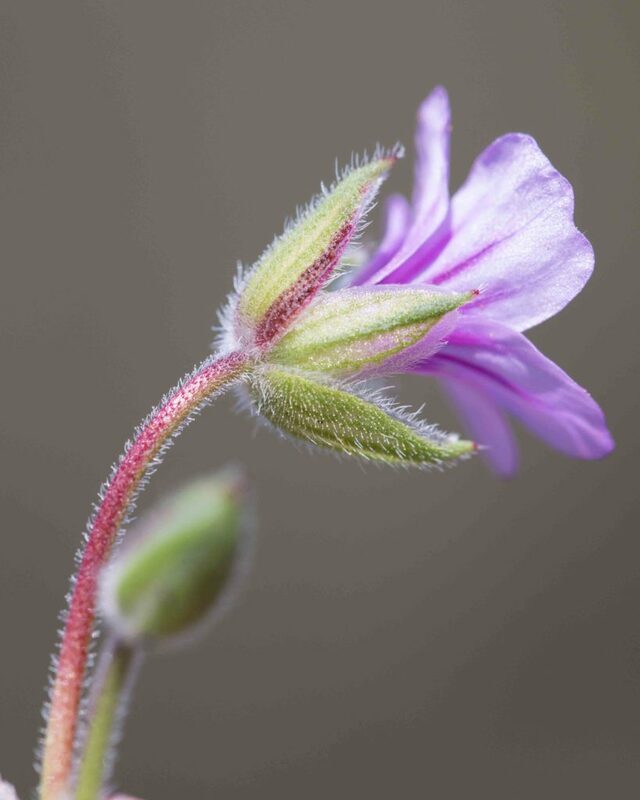 A distinctive feature is that one of the five sepals always has a dark red strip on its margins. 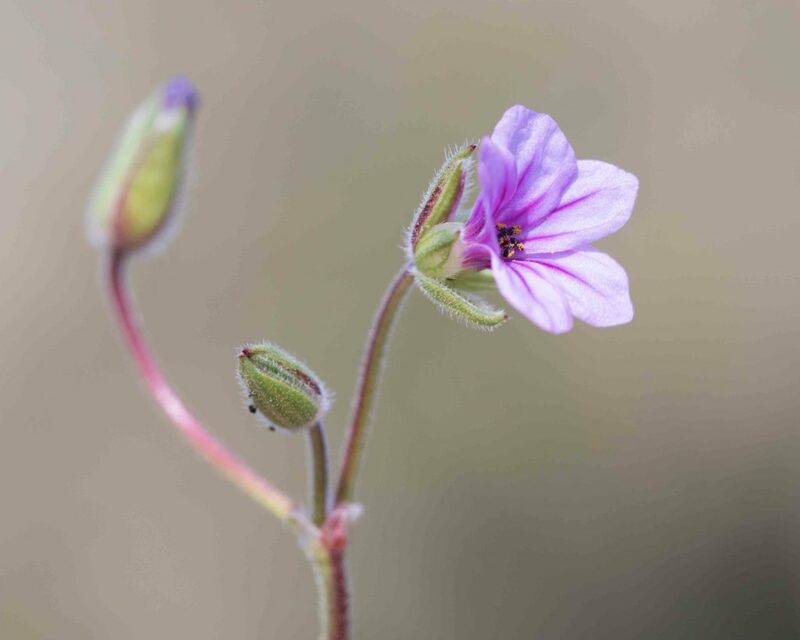 The fruits of this species are also noticeably longer (5–12 cm) than in the other Erodiums. Leaves are lobed or dissected with the reddish veins clearly visible in the younger leaves which can form a dense rosette. 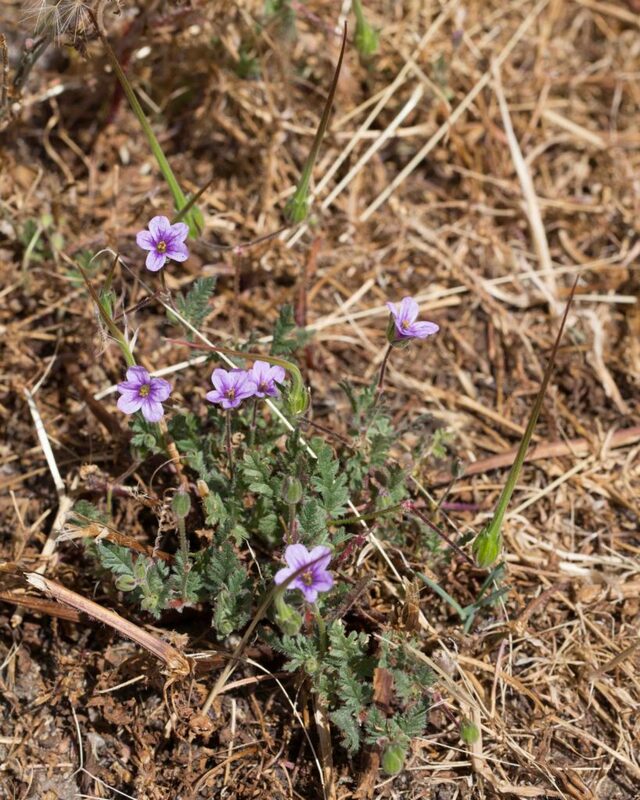 See below for the very similar Foothill Filaree (Erodium brachycarpum). 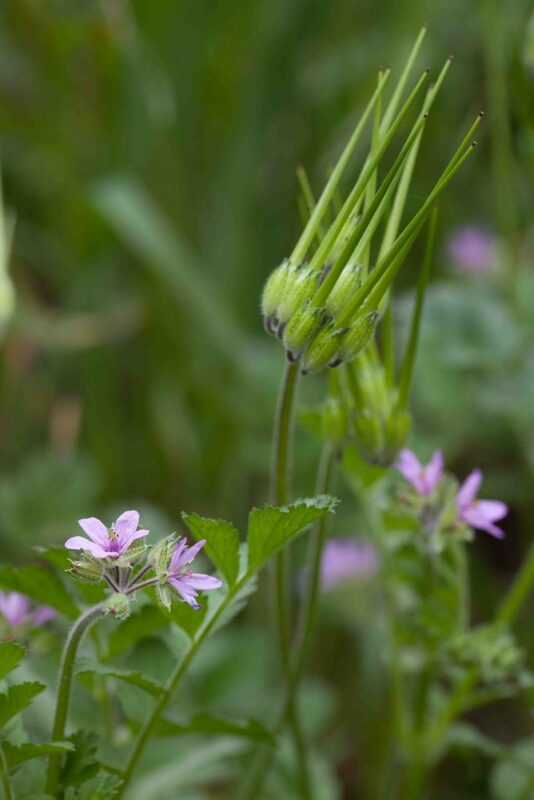 This is very similar to Long-beaked Filaree (Erodium botrys) and is easily mistaken for it. 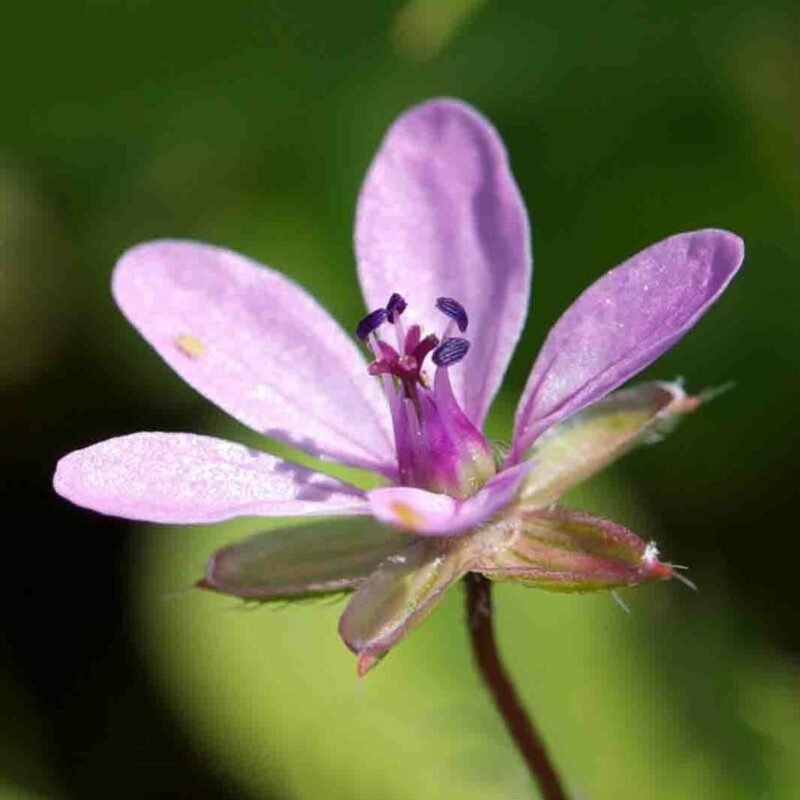 Close examination of the pedicel will reveal one of the two differences. The hairs are shorter and straighter and many are clearly glandular. 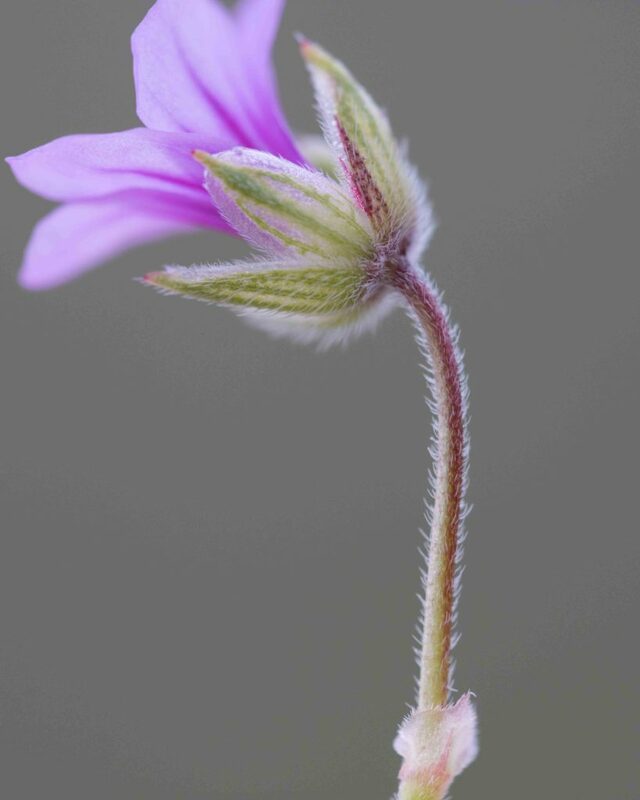 The hairs on the stem of Long-beaked Filaree are consistently longer and curved upwards and are not glandular. The picture on the left shows the Foothill Filaree, the one on the right shows the Long-beaked Filaree for comparison. Another difference (which requires good magnification and some practice to see) is found in the base of the fruits where this species has rounded pits subtended by 1–2 hairy ridges. 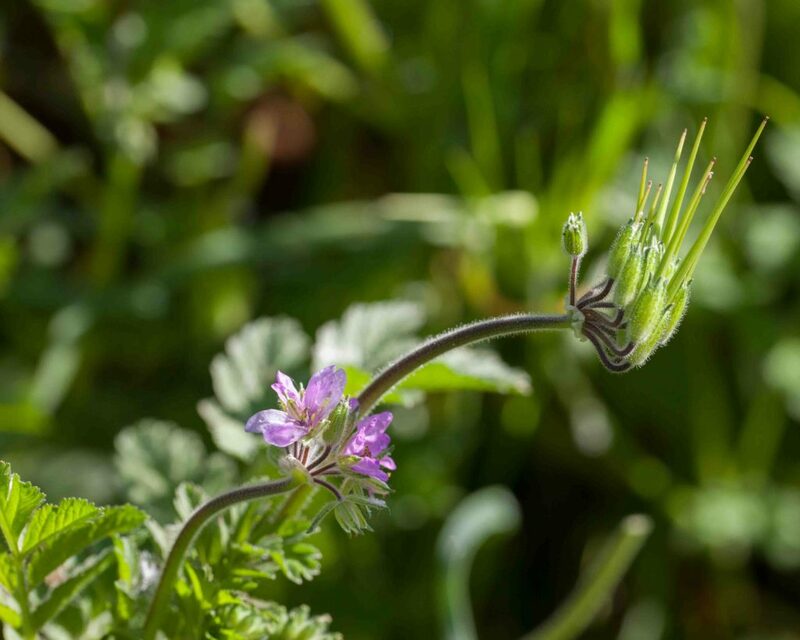 This is even more common that Long-beaked Filaree (Erodium botrys) though a little less conspicuous because of its smaller size. 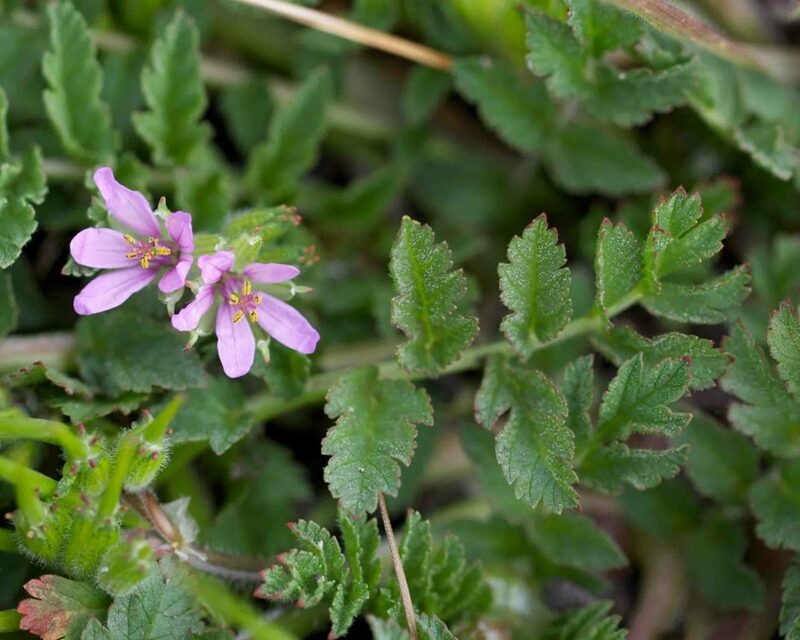 Despite being an invasive weed, it has pretty pink flowers with ovate, clearly separated pink petals. 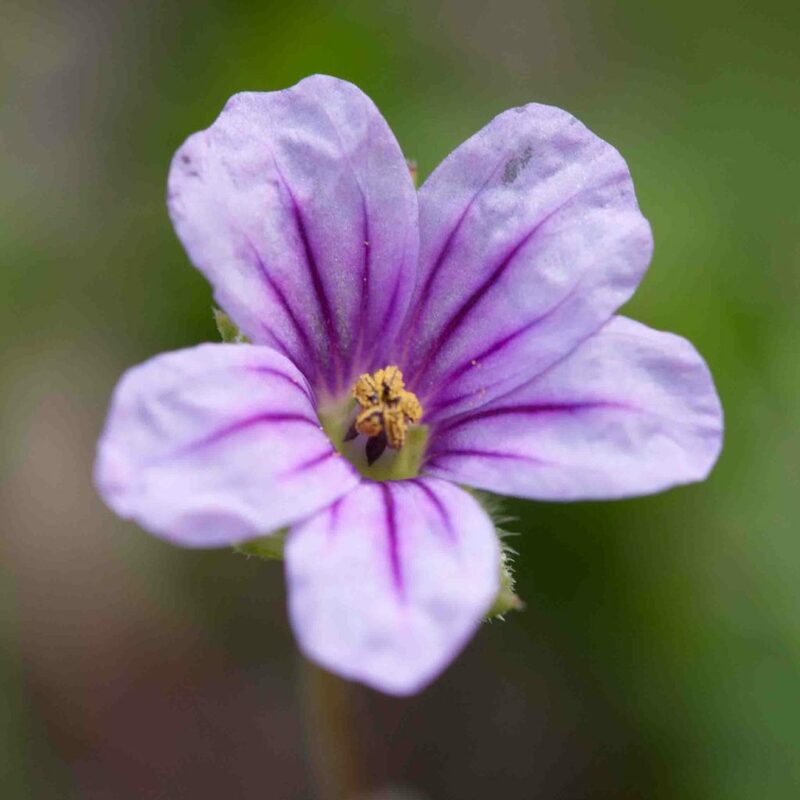 Stems are slender and generally reddish which by itself allows the species to be differentiated from White-stemmed Filaree (Erodium moschatum) whose flowers can sometimes appear very similar but which has fatter, greenish-white stems. Fruits are similar to those of Long-beaked Filaree but smaller (4–7 cm). 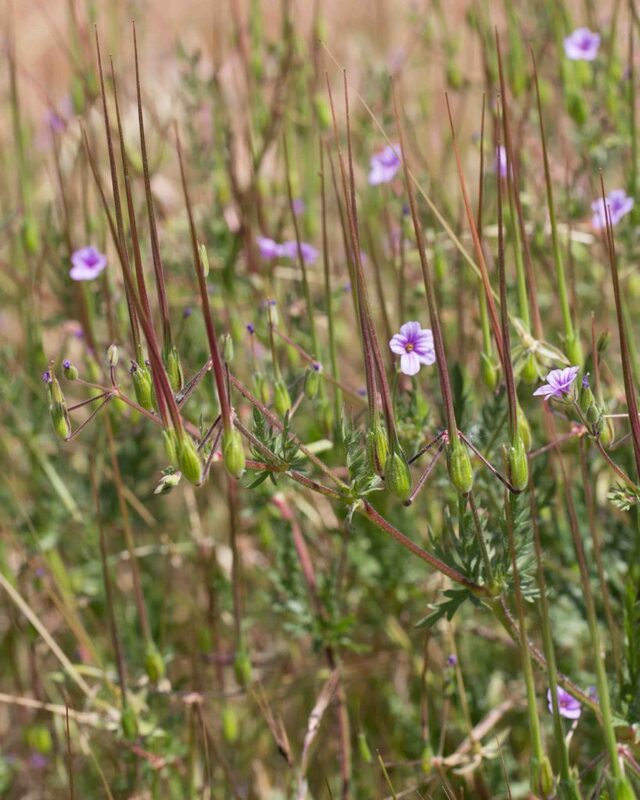 Leaves are pinnate with deeply lobed or divided segments. 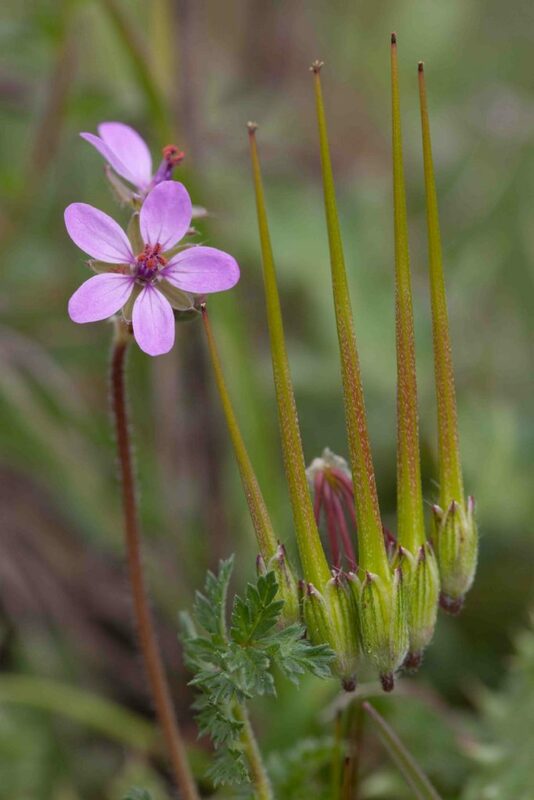 The flowers of this species are very similar to Red-stemmed Filaree (Erodium cicutarium) but it has fatter, greenish-white stems, easily distinguished from the slender reddish stems of Red-stemmed Filaree. 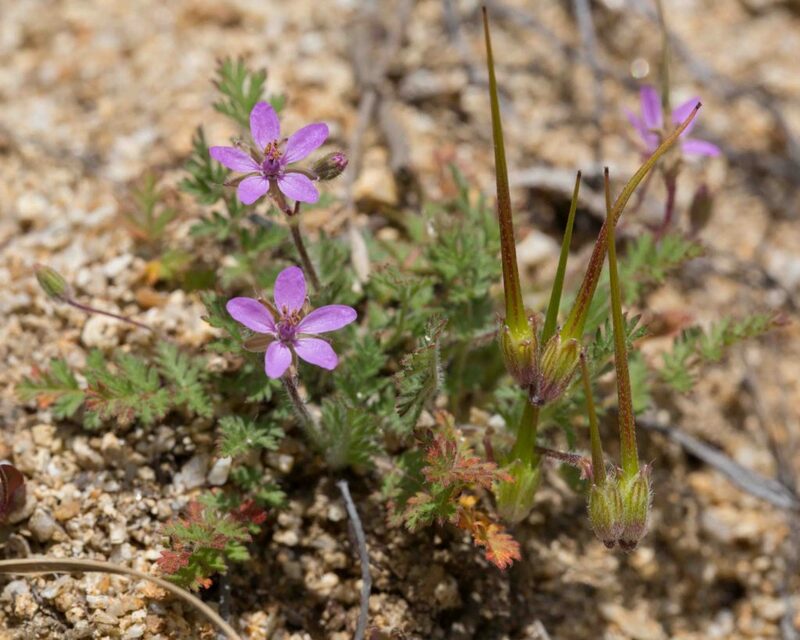 The peduncles also typically have a larger number of flowers. Fruits are very similar though a little smaller (4–6 cm). 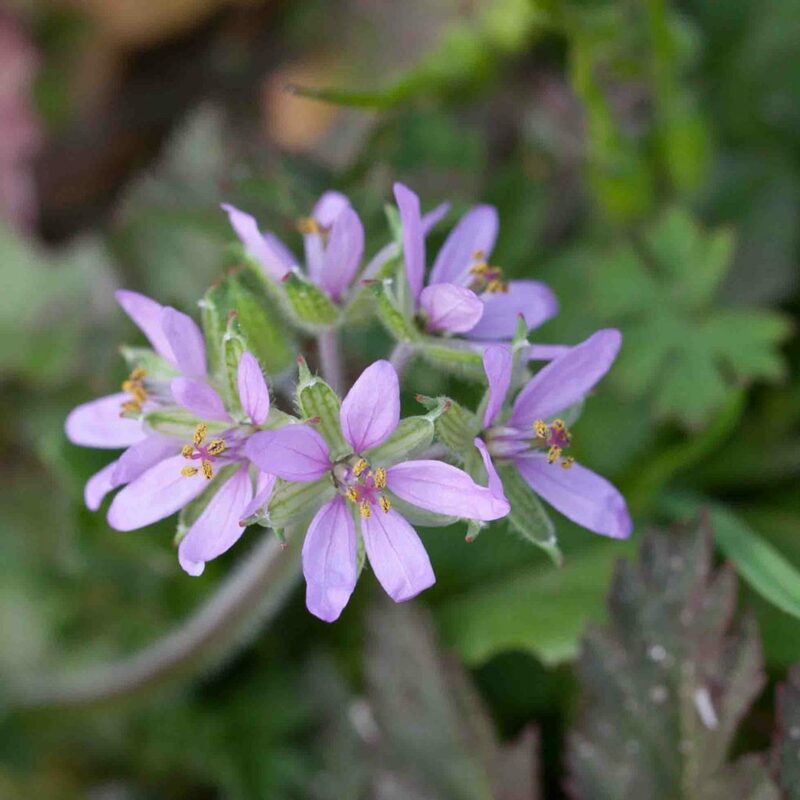 Leaves are are lobed or shallowly divided.